On November 20, 2018, the Insurance Journal reported an article suggesting auto insurance premiums will decrease by $25 billion by 2025. To put that in perspective, that is approximately 5% of all U.S. P&C premiums. Think you've seen a soft market before? Just wait. What coverage has, arguably, the least amount of continuity from one form to another? Cyber. Thousands and thousands of forms exist (often carriers have more than three cyber forms). 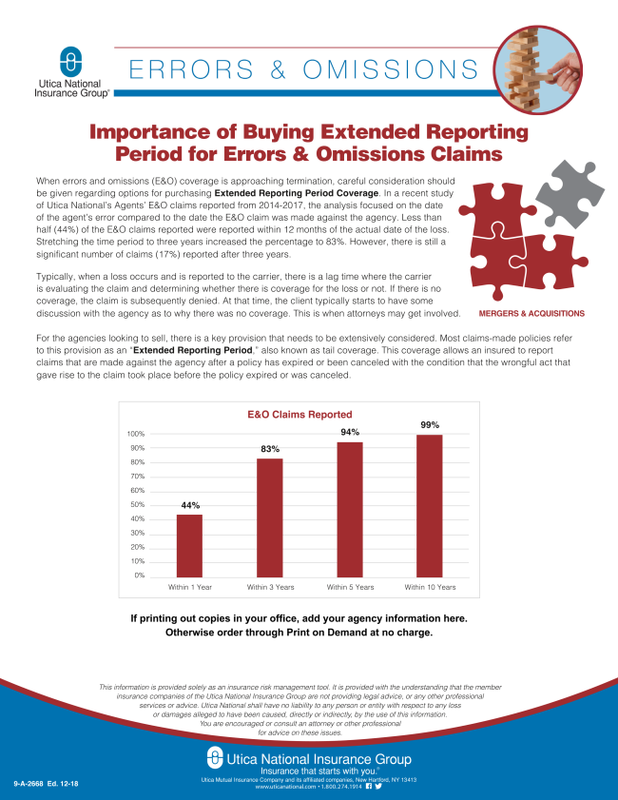 When errors and omissions (E&O) coverage is approaching termination, careful consideration should be given regarding options for purchasing Extended Reporting Period Coverage. Disputes over sales commission arrangements have led to confusion, hurt feelings, turnover and lawsuits. Here's a checklist to consider when creating sales commission agreements. Reading Forms: Is it really necessary? Of course not! Lots of people have made careers in this industry without reading forms or understanding the coverages they are selling. AZBEE Editorial Award Regional Finalist! The article continued to state that new coverage lines will more than make up the difference, according to the report author, Accenture. They propose that businesses in particular will buy $81 billion more in other lines. This means woe for the personal lines carriers and agents who have achieved far more personal lines premium growth in the last ten years than commercial (an average annual rate increase of approximately 3.3% vs. -.1%, 2005-2017, inclusive). The authors argue driverless cars will make the roads safer but increase the need for product liability. I am not sure about this since it has been reported that some manufacturers are planning to forego product liability insurance on their driverless cars. Maybe they had a change of mind or the authors are providing insights missing from press releases the SEC might want to review. Or maybe the manufacturers' contracts will place all liability on their vendors or others (like the owners who do not read their software agreements). The authors suggest consumers, companies and governments will quickly buy much more cyber coverage. They probably do need to quickly buy more but with as many as 3,000 cyber forms floating around in the U.S. alone (according to a recent Rand Corp study), what cyber is actually being purchased? The Rand study is important to understanding future cyber purchases because, as they suggest, some of the forms may not be intended to pay claims, some companies' actuarial models may be shots in the dark, and clearly some companies' forms indicate they really do not know what they are doing (at least this is my impression of Rand Corp's conclusion). These are big issues that put into doubt what the cyber insurance market really even is and what happens with the inevitable shakeout? If some companies do not really know what they are insuring (reading some companies' forms suggest they really do not know what they are insuring) and taking shots in the dark on pricing (and reserving maybe?) suggest potentially a problem of stronger and smarter companies not achieving adequate market share until the shakeout occurs. Add to this confusion the fact that explaining cyber insurance, and explaining exactly what the different cyber forms are insuring, is very difficult. Agents need to try doing this to understand that increased cyber sales are not magically going to happen. Beware the agent that pretends all cyber forms are the same or that just because an insured has purchased a cyber policy, they now have "cyber" coverage. The insured may think they have much broader coverage than the carrier interprets (which will be interesting for those companies less sure of what they are even insuring, see the Mondelez v. Zurich suit for a great example). Also, after asking dozens and dozens of agents what they are even insuring when they sell a cyber policy, I'm often met with blank stares or statements that they do not understand cyber so they don't sell cyber. Product liability sales may increase. Product liability has been one of the most volatile major lines of P&C insurance over the last twenty plus years that any prediction specific to this line seems problematic. Since 1996, NPW specific to product liability per A.M. Best (author's calculation) has only increased 35%. Private passenger auto has increased 106%. In the last ten years, NPW has actually declined 10.5%. I am not suggesting these results are rational either because the combined ratio for product liability is an abysmal 129% over the last ten years. Its worst combined ratio was 159.4% in 2011 and its best was 84.4% in 2006. The volatility is absurd and does not really correlate well with NPW growth. This combination of volatility and lack of charging more premium for really horrible combined ratios makes predicting this line's future problematic. I hope these experts' predictions are correct regarding other lines taking up the slack. Even if correct though, personal lines agents and personal lines carriers are going to suffer if they do not begin writing commercial. Small commercial will be hurt too because small commercial will lose the auto, they seem more reluctant to buy the quality cyber coverage and they do not usually need product liability. The winners, if the study's authors' predictions are correct, will be carriers and agents/brokers writing large, complex commercial accounts. If the authors are wrong about companies and consumers purchasing a lot more insurance but of a different line, then the entire industry suffers mightily. Another article in the same edition published a report from Minnesota’s Department of Labor that the state's workplace injury and illness rate decreased in 2017 to its lowest rate since the state first began measuring it. I suspect Minnesota's results are similar to other states. The significant advances in safety and the reduced need for employees to work in more dangerous environments relative to total employment support the probability that workplaces should be safer than ever, even in a booming economy. The workplace will become even safer with more modular construction, better safety devices and monitoring, and continuing emphasis on safety. A safer environment means less rate in this line too. Maybe the industry needs to offer more law school scholarships to future plaintiff attorneys to take up the slack. Otherwise, most signs point strongly to the devaluation of insurance. Insurance is more important in a risky world than a safer world. Maybe insurance companies will get desperate and begin insuring previously unthinkable, uninsurable perils and fill the gap that way. Whatever happens though, insurance sales are going to change significantly. The industry is at an inflection point for carriers and distributors both. This is not a point of despair but it is a time that requires true strategic thinking and planning to identify the opportunities that exist and to plan for those opportunities, without getting too far ahead and losing what one already has. This is hard work. It requires quite a balance which is why dedicated strategic planning is truly required. What coverage has, arguably, the least amount of continuity from one form to another? Cyber. Thousands and thousands of forms exist (often carriers have more than three cyber forms). Which coverage is expected to realize the highest growth rate? Cyber. Which of two coverages keep CEO's, CFO's, and CIO's awake at night are most desired from agents? Cyber (the other is business income). What coverage has been written using entirely unique definitions, definitions for common insurance words that have very different meanings in these forms? Cyber. Which coverage is often discussed as one coverage but is really, at the very least, 13 separate coverages? Cyber. Which coverage commonly creates a situation in which clients may need two different policies from two different carriers to actually provide the coverage they need? Cyber. For which coverage do you need Burand Insurance Education’s Awesome Fifteen Part Program? Cyber! And where are E&O Exposures huge especially when producers do not know what coverages they are selling? CYBER! Cyber is arguably the most complex and difficult coverage in the market today. It is a coverage that is being severely undersold and under bought because the sellers do not understand it well enough to explain to the buyers why they need it. Our program teaches you how to discuss each part of the cyber program and how to discuss each part with your clients. We teach how to carefully read each part of the 13 distinct cyber insurance coverages specific to cyber and how to identify which carriers do not offer important parts. We teach how to understand the missing definitions and unusual definition (including one well known form where "claims" are not even possible). The cyber solution is never 100% insurance either. That is likely impossible, so each class also addresses risk management solutions producers can offer, for each of the 13 parts, without having to become an IT security expert. We have been advised by agents specializing in cyber we have the most thorough cyber program in the market, but more importantly, the most useful real world cyber program. Every commercial producer needs to understand cyber today for their clients' and their agencies' E&O. Do you want to be more effective, have better client relationships, make more money, and decrease your chances of being sued? Then cyber training is for you. Contact me at 719-485-3868 or chris@burand-associates.com to arrange our detailed and thorough fifteen part Cyber Coverage Training Program. More information is at www.burandeducation.com. 1. Make sure the agreement aligns with corporate strategy. For example, is the focus to create new accounts, maintaining the profitability of sales, launch specific products, up- sell existing customers, etc.? 2. Sales commission agreements only apply to people making sales. Everything else will be considered a bonus or incentive agreement, which we won't be discussing here. Of course, you can add incentives and bonuses to the compensation mix. Quality of customer or client. Lifetime value of the customer or client. Ongoing support of customers or clients. 4. Establish performance requirements/quotas for activities and/or outcomes. For example, you may require people to make a minimum number of calls, appointments, proposals, etc. 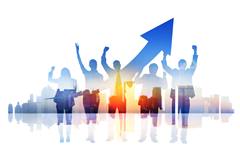 You may also have quotas based on the number of new customers, total sales, referrals, etc. 6. Define the dollar limits when approvals are required for sales. 7. Define when a sale is "earned." Is it at the time of invoicing, delivery, or payment? 8. Watch for legality surrounding offset for returns, etc. not directly attributed to that salesperson. 9. Use typical examples when defining sales terms and commission formulas. 10. Be clear about any offsets against draws. How long will negative draws carry over? For example, it may carry over indefinitely until all caught up with commissions earned. 11. Since every workweek stands alone for minimum wage and overtime computation, any draw can be recovered only from commissions earned in that work week. 12. Define what happens to commissions earned, but not paid, at the time of termination. Usually, if the salesperson has completed everything they need to do to earn the sale, then they are entitled to a commission post-termination, unless there's ongoing service or support obligation. Behavioral: Does the company control or have the right to control what the worker does and how the worker does his or her job? Type of Relationship: Are there written contracts or employee type benefits (i.e., pension plan, insurance, vacation pay, etc.)? Will the relationship continue and is the work performed a key aspect of the business? Get this wrong, and you can expose yourself to extensive violations, taxes, and penalties. 14. Understand the legal obligations surrounding inside sales and outside sales when it comes to overtime exemptions and minimum wage requirements. Many employers erroneously assume that employees qualify for the inside sales exemption merely by engaging in sales from the employer's office. Under federal law, the inside sales exemption applies only to employees who (a) earn over 150% of the minimum wage, (b) derive at least 50% of their income from commissions, and (c) work in the "retail and service industry." Employers are engaged in the "retail and service industry" within the meaning of the Fair Labor Standards Act if they derive at least 75% of their annual sales revenue from goods or services, not for resale and are recognized as a retail or service establishment in their industry. Under California law, the inside sales exemption is applicable only if (a) the employee earns over 150% of the minimum wage, (b) over 50% of the employee’s compensation is derived from commissions, and (c) the employee works in the mercantile industry (covered by Wage Order 7) or in a professional, technical, clerical, mechanical or similar occupation (covered by Wage Order 4). Outside sales are specifically limited to those employees who customarily and regularly work more than half the working time away from the employer's place of business selling tangible or intangible items or obtaining orders or contracts for products, services, or use of facilities. 15. All commissions must be paid within a reasonable time depending on the transactions involved. 16. When a salesperson is terminated, the employee has been prevented from completing the duties involved in an eventual sale; they may be able to recover all or a pro rata share of the commissions. 17. Any non-competition/non-solicitation language. Note: not allowed in CA. Don Phin, Esq. is a veteran employment lawyer and also a highly rated presenter on the emotional intelligence required to be great at sales. To learn more go to www.donphin.com. I've met plenty of attorneys too who probably surprised themselves when they passed the bar. I know I have been surprised they have a license to practice law. Insurance forms are nothing but legal contracts so if attorneys don't have to know contract law, why should agents have to understand the insurance contracts they are selling? Plenty of truly incompetent people in many fields make good livings so being competent really is not a requirement. To some degree, professional liability insurance exists for these people. Being competent is a personal choice. For some people, they are content to be incompetent if they can pay their bills. I have met many agents like this. I have met many E&O who attorneys advise agents to not be professional because as an amateur (if you are not professional you are amateur by definition), the standard of care is less and I have heard many agents ask, and even beg, for even lower standards of care so they cannot be held liable for their incompetence. Some of the InsurTech's definitely want a low standard of care because their models are based on some combination of price and ease of use, not coverage. Several direct writers strike me similarly. One particular area of incompetence that I have witnessed innumerable times is the inability and/or unwillingness to read policies and forms. A competent producer will read and endeavor to understand the forms they are selling so they can advise clients appropriately. An incompetent agent will not. Many underwriters have been so inadequately trained today that their opinion is usually of limited value. I hate to be so harsh having started my career as an underwriter. But with predictive modeling, some companies do not really need underwriters that know coverages. With only a few exceptions where the underwriter has many years' experience usually working for multiple companies, the underwriter will likely not know more than their company's formats. Unless the producer gets an explanation from all their companies' underwriters, one explanation does not work. Believe it or not, not all policies and forms read the same. I know this comes as a surprise to many, especially those who do not read policies and therefore would not know that different companies' forms read differently, but material differences actually exist. Are there shortcuts to reading the whole boring policy(ies)? If all policies were the same, one set of cliff notes should suffice. But that is not the case. An agent can read examples relative to specific forms but all case law is based on the actual contractual wording. If the contractual wording in a contract is materially different, that case law may not apply! A common question I get is, where can I research this coverage rather than reading the forms? Since the coverage varies based on the form, one might want to read the form. Another comment/question I get is, I like researching coverages on Google. What are your thoughts? Does Google actually have an analysis of the form you are selling? If not, other than extremely basic data, one might want to read the form. Reading and understanding the forms is part and parcel of being a professional agent. Being a professional agent is a personal choice. It is your choice. What choice will you make? Chris Burand is president and owner of Burand & Associates, LLC, a management consulting firm that has been specializing in the property/casualty insurance industry since 1992. Burand is recognized as a leading consultant for agency valuations, helping agents increase profits and reduce the cost of sales. His services include: agency valuations/due diligence, producer compensation plans, expert witness services, E&O carrier approved E&O procedure reviews, and agency operation enhancement reviews. He also provides the acclaimed Contingency Contract Analysis® Service and has the largest database and knowledge of contingency contracts in the insurance industry. Burand has more than 30 years' experience in the insurance industry. He is a featured speaker across the continent at more than 300 conventions and educational programs. He has written for numerous industry publications including Insurance Journal, American Agent & Broker, and National Underwriter. He also publishes Burand's Insurance Agency Adviser for independent insurance agents. Burand is a member of the Institute of Business Appraisers and NACVA, a department head for the Independent Insurance Agents and Brokers of America's Virtual University, an instructor for Insurance Journal's Academy of Insurance, and a volunteer counselor for the Small Business Administration's SCORE program. Chris Burand is also a Certified Business Appraiser and certified E&O Auditor. NOTE: The information provided in this newsletter is intended for educational and informational purposes only and it represents only the views of the authors. It is not a recommendation that a particular course of action be followed. Burand & Associates, LLC and Chris Burand assume, and will have, no responsibility for liability or damage which may result from the use of any of this information. Burand & Associates, LLC is an advocate of agencies which constructively manage and improve their contingency contracts by learning how to negotiate and use their contingency contracts more effectively. We maintain that agents can achieve considerably better results without ever taking actions that are detrimental or disadvantageous to the insureds. We have never and would not ever recommend an agent or agency implement a policy or otherwise advocate increasing its contingency income ahead of the insureds' interests. A complete understanding of the subjects covered in this newsletter may require broader and additional knowledge beyond the information presented. None of the materials in this newsletter should be construed as offering legal advice, and the specific advice of legal counsel is recommended before acting on any matter discussed in this newsletter. Regulated individuals/entities should also ensure that they comply with all applicable laws, rules, and regulations. If you wish to be removed from this mailing, please e-mail AgencyAdviser@burand-associates.com.